First the bad news: in a news release issued today AT&T announced that it was dropping the unlimited data plans on both the iPad and iPhone in favor of a $25.00/mo plan that caps data at 2GB. Those that currently have the unlimited data plan can opt to keep it or they may change to the cheaper, yet data capped 2GB plan. The good news of the day (well, partly good news) is that those of us that have been patiently waiting to tether our laptops to our iPhones well, it seems that will be possible this summer with the release of iPhone OS 4. However, in order to tether your iPhone you must be on the limited 2GB per month plan and pay an extra $20.00 per month for the privilege. What does that mean? If you want tethering you must give up your unlimited dataplan and opt for the capped plan limited to 2GB per month. Ouch. AT&T*, the U.S. smartphone leader, today introduced new wireless data plans that make it more affordable for more people to enjoy the benefits of the mobile Internet. Customers can pick the new data plan that best meets their needs – either a $15 per month entry plan or a $25 per month plan with 10 times more data. Current smartphone customers are not required to switch to the new plans, but can choose to do so without a contract extension. Each plan includes unlimited access at no additional charge to more than 20,000 AT&T Wi-Fi Hot Spots in the U.S. Customers can also use unlimited Wi-Fi at home, in the office or elsewhere if available. AT&T will also help customers manage their wireless data usage by sending free text messages after customers reach different usage intervals and by providing online tools, including a smartphone app that shows monthly usage information. DataPlus. Provides 200 megabytes (MB) of data – for example, enough to send/receive 1,000 emails (no attachments), plus send/receive 150 emails with attachments, plus view 400 Web pages, plus post 50 photos on social media sites, plus watch 20 minutes of streaming video – for just $15 per month. ** This plan, which can save customers up to 50 percent off their wireless data charges, is designed for people who primarily like to surf the web, send email and use social networking apps. If customers exceed 200 MB in a monthly billing cycle, they will receive an additional 200 MB of data usage for $15 for use in the cycle. Currently, 65 percent of AT&T smartphone customers use less than 200 MB of data per month on average. DataPro. Provides 2 gigabytes (GB) of data – for example, enough to send/receive 10,000 emails (no attachments), plus send/receive 1,500 emails with attachments, plus view 4,000 Web pages, plus post 500 photos to social media sites, plus watch 200 minutes of streaming video – for $25 per month. ** Should a customer exceed 2 GB during a billing cycle, they will receive an additional 1 GB of data for $10 for use in the cycle. Currently, 98 percent of AT&T smartphone customers use less than 2 GB of data a month on average. Tethering. Smartphone customers – including iPhone customers – who choose the DataPro plan have the option to add tethering for an additional $20 per month. Tethering lets customers use their smartphones as a modem to provide a broadband connection for laptop computers, netbooks or other computing devices. Tethering for iPhones will be available when Apple releases iPhone OS 4 this summer. The vast majority of smartphones that AT&T offers have built-in Wi-Fi, which lets the devices automatically switch from the wireless network to a Wi-Fi hotspot without prompting, making Wi-Fi even more convenient and easy to use. This enables customers to use Wi-Fi in the home, office and at public locations where available. Wi-Fi will generally provide consistently fast speeds and does not count against a customer’s monthly data plan usage total. In addition, virtually all AT&T smartphone customers have access at no additional charge to more than 20,000 AT&T Wi-Fi Hot Spots in the U.S. Customers can get more information on how to use Wi-Fi and find the location of AT&T Wi-Fi Hot Spots at www.att.com/wifiaccess. Customer Text Notifications On Data Usage. When customers begin to approach their monthly usage limit, AT&T will send three text notifications – after they reach 65 percent, 90 percent and 100 percent of the threshold. Customers will also be sent emails if AT&T has their email address. Data Usage Monitoring. Additionally, customers with iPhones and other select devices can use the free AT&T myWireless application to check data usage. The application is available for download in several smartphone app stores. Also, AT&T customers can call *DATA# from their wireless phone to check their data usage for the current billing period. They receive a free text message with their usage information. Customers can also go online to www.att.com/wireless to see all of their usage information, past and present. Data Calculator. The easy-to-use online data calculator enables customers to estimate their mobile data usage and get a better sense for which data plan is right for them. It’s located at www.att.com/datacalculator. ** Usage examples are estimates. Individual results will vary based upon customer’s Internet usage patterns. *** Customers will see their usage reflected in their tools generally within 15 hours or less of actual data usage. Largest Wi-Fi network claim based on non-municipal company and owned and operated hotspots. An 802.11 b/g enabled device required. AT&T Inc. (NYSE:T) is a premier communications holding company. Its subsidiaries and affiliates – AT&T operating companies – are the providers of AT&T services in the United States and around the world. With a powerful array of network resources that includes the nation’s fastest 3G network, AT&T is a leading provider of wireless, Wi-Fi, high speed Internet and voice services. A leader in mobile broadband, AT&T also offers the best wireless coverage worldwide, offering the most wireless phones that work in the most countries. It also offers advanced TV services under the AT&T U-verseSM and AT&T |DIRECTVSM brands. The company’s suite of IP-based business communications services is one of the most advanced in the world. In domestic markets, AT&T Advertising Solutions and AT&T Interactive are known for their leadership in local search and advertising. In 2010, AT&T again ranked among the 50 Most Admired Companies by FORTUNE® magazine. Information set forth in this news release contains financial estimates and other forward-looking statements that are subject to risks and uncertainties, and actual results may differ materially. A discussion of factors that may affect future results is contained in AT&T’s filings with the Securities and Exchange Commission. AT&T disclaims any obligation to update or revise statements contained in this news release based on new information or otherwise. This news release may contain certain non-GAAP financial measures. Reconciliations between the non-GAAP financial measures and the GAAP financial measures are available on the company’s Web site at www.att.com/investor.relations. Accompanying financial statements follow. Today, AT&T announced a shocking reversal of a policy that many considered to be the Achilles heal of the iPhone on the AT&T network. That’s right, AT&T announced today that they would permit VoIP apps to run on their 3G network and informed the FCC and Apple Inc. of their change of heart. Yes, you read that right. However, we have no clue on what impact, if any, the decision will have on Google Voice apps for the iPhone/iPod Touch. However, users of Skype and Vonage should be seeing some 3G love soon. AT&T* today announced it has taken the steps necessary so that Apple can enable VoIP applications on iPhone to run on AT&T’s wireless network. Previously, VoIP applications on iPhone were enabled for Wi-Fi connectivity. For some time, AT&T has offered a variety of other wireless devices that enable VoIP applications on 3G, 2G and Wi-Fi networks. AT&T this afternoon informed Apple Inc. and the FCC of its decision. In late summer, AT&T said it was taking a fresh look at VoIP capabilities on iPhone for use on AT&T’s 3G network, consistent with its regular review of device features and capabilities to ensure attractive options for consumers. AT&T allows customers to download or launch on their wireless devices a multitude of compatible applications directly from any lawful Internet website. Additionally, because AT&T uses GSM technology, the most pervasive and open wireless technology platform in the world, we support customers using any GSM phone that works on AT&T’s frequencies. If you haven’t seen the free text yet, then check your phone. 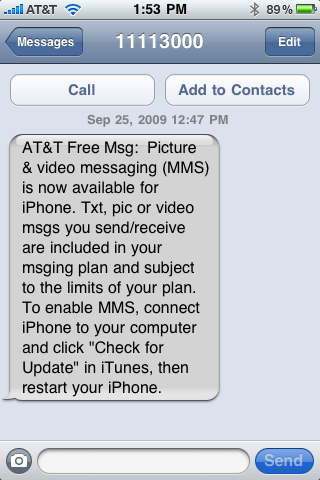 AT&T is rolling out MMS (multimedia messaging) on their network today for iPhone. This is a long awaited feature, one that many users have been quick to point out should have been included with the original iPhone launched in 2007. Here we are more than two years later and the iPhone is just now getting the ability to send mms like many phones have been able to do for years. However, AT&T is not the only one at fault here. Apple did not include MMS functionality in the iPhone until it’s latest 3.0 firmware update. This update didn’t hit iPhones until June of this year. So while we had to wait for Apple to include the core functionality, AT&T was not ready for it either. Unlike (nearly) every other carrier that was ready for mms, and rolled it out simultaneously with OS 3.0, AT&T chose not to enable the function until today. Their reason? network bandwidth. Apparently they are bracing themselves for an onslaught of MMS texts coming from the iPhone. At any rate, it’s here. Go get your carrier update file by simply connecting your iPhone to your computer with iTunes running. The update is painless and takes less than 5 seconds to complete. Then, voila! you’re off to a happy ending with MMS. 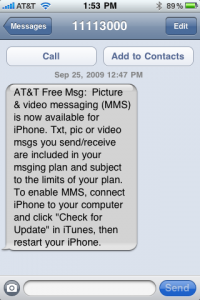 We recently posted about the AT&T MMS announcement (MMS is coming September 25th). Well, AT&T is now attempting to educate the masses on the complexities and difficulties of keeping up with Today’s smartphones (read: iPhone) in a YouTube video posted today. Seth, the AT&T spokes person in the video, explains that AT&T has invested $38 BILLION into their network over the past two years. Most of that focus is in expanding the 3G 850mhz bandwidth and capacity. $38 Billion? Really? AT&T released a long-overdue account management app for the iPhone. The app allows users to view and pay bills, view voice and data usage and browse account features. I took the app for a spin today and found pretty much all the functionality that I would be looking to do online, in the app. The app is really pretty complete as it even covers family accounts and individual usages for each member on the account. While I don’t look very often at my AT&T account online (or even the bill for that matter) this app should make it a ton easier for those that do. 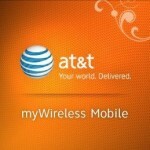 AT&T myWireless Mobile is free in the iTunes App Store. If you’re like me and plugged your iPhone into your computer today you likely notice a prompt from iTunes to update your phone’s carrier information. MobileCrunch.com has the details of the udpate, which appears to be nothing more than a couple of images for AT&T’s new MicroCell service for residences. So no worries, update away.